In August I packed up for a two-week vacation. I spent a week in Israel visit a dear friend from college and a week in the United Kingdom (more on that later). My first trip to the Middle East was amazing. I had no idea what to expect getting off the plane but I was up for the adventure. Thankfully I had an amazing tour guide who lives in Tel Aviv. Before I left, I got quite a few questions about why I was going. The most popular question was ‘Are you Jewish?’ followed by a look of confusion when I told them I wasn’t. People were confused that I was willing and excited to go to the Middle East. I think it’s such a shame that we’ve condensed the entire middle east to the desert and areas of destruction that we see on the news. We’ve taken a multitude of cultures and religions and landscapes and reduced them to dessert and terrorists. I was blown away with the liveliness of Tel Aviv as well as how incredibly friendly everyone was! On more than one occasion someone tried to strike up a conversation with me on the street in Hebrew. I never once felt unsafe in my time in Israel. You can get along just fine not knowing any Hebrew. I picked up a couple of words along the way – Shalom (hello), Toda (thank you). Most restaurants will also have menus in English. If you aren’t Jewish (and maybe even if you are) you’ll likely be questioned by border security, both entering and leaving the country. I got asked all the usual questions – where are you staying, how do you know the person you’re visiting, how long have you been here, etc. Plus a few odd ones – have you ever studied hebrew? Plan some extra time at the airport when you leave in case you get caught in extra security. One last note before we dive in: this is a fairly relaxed itinerary. We took our time and had lazy mornings most days. You could definitely cover most to all of this in 3-4 days if you opt for a jam-packed schedule. The best cure for jet lag? A relaxing day at the beach. Enjoy the people watching – you’ll find a mix of other tourists and locals here on a nice day. You’ll see folks from all over Europe, the rest of the Middle East and Russia. Don’t be alarmed by the announcements – they’re telling you that glass is forbidden and other general notices. Today is a great day to pack a picnic and enjoy the sun! If you are traveling in August (like I did), you probably won’t want to spend more than half a day at the beach. It’s just too hot to spend any longer in the sun. Today is the day to rent a car and head to the Dead Sea. But you won’t need to leave until the afternoon. I spent my morning perusing the local grocery store and going to the fruit market. You learn so much about a culture in how they shop for food! I used my card most everywhere in Tel Aviv. But when I showed up to buy some fresh grapes and tomatoes, the card reader wasn’t working. Instead of sending me away, the nice shop owner sent me off with my produce and told me to come back and pay him later! After scrounging up enough cash to pay the kind produce man, we headed out to pick up our rental car. The drive from Tel Aviv to the Dead Sea is about 2 hours via google maps, but the roads are incredibly windy when you get close to the Sea. I think the drive took us about 3 hours total with traffic. The drive is incredibly scenic. Just leaving Tel Aviv, the landscape is lush and green farmland scattered with Arab villages just outside the cities. As you get closer to the Dead Sea, everything becomes rolling hills of desert, complete with camel crossing signs. We arrived too late in the afternoon to enjoy the Dead Sea this day, but we took full advantage of our hotels salt water pool, with a similar effect as the Dead Sea. 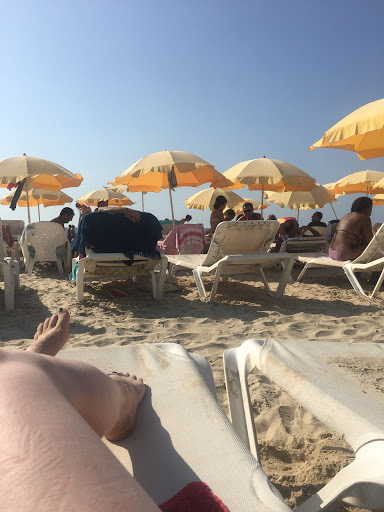 We woke up fairly early so we could take full advantage of the Dead Sea time today. We enjoyed breakfast at the hotel and then packed up our belongings so we could check out before we left for the Sea and not need to worry about coming back quickly. 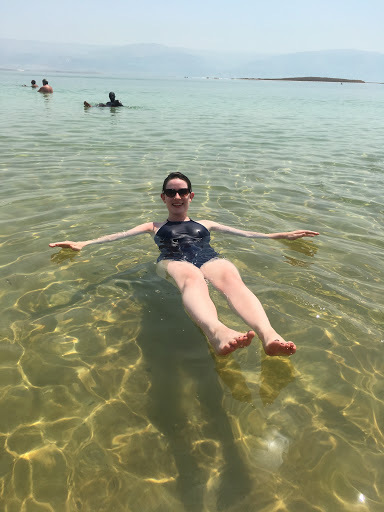 Floating in the Dead Sea is like a tongue twister for your brain. You know that it works and that’s what should be happening, but it also doesn’t make sense. It’s also utterly effortless. Just lay back and relax. The picture below is from just 10 inches of water. I highly recommend booking a hotel for the night just for the access to the private beaches. They are much less crowded than the public beach down the road and you can enjoy the experience peacefully. While you’re floating, or while taking a break of floating, take a moment to revel in the wonder of this beautiful world we live in. Revel that those mountains just across the way, that almost look like you could swim to them, are Jordan. Before you leave, be sure to pick up some Dead Sea mud to slather your body with. Nature’s spa treatments are magnificent. We arrived back in Tel Aviv just in time to catch the sunset over the water. I’ve never met a sunset I didn’t like, but I was extra drawn to the beauty of a Tel Aviv sunset. Nachalat Benjamin is a perfect place to pick up a nice gift or two for someone back home. It’s an artist market so everything is handmade. This is the perfect way to spend a few hours wandering and admiring the beautiful craftsmanship. 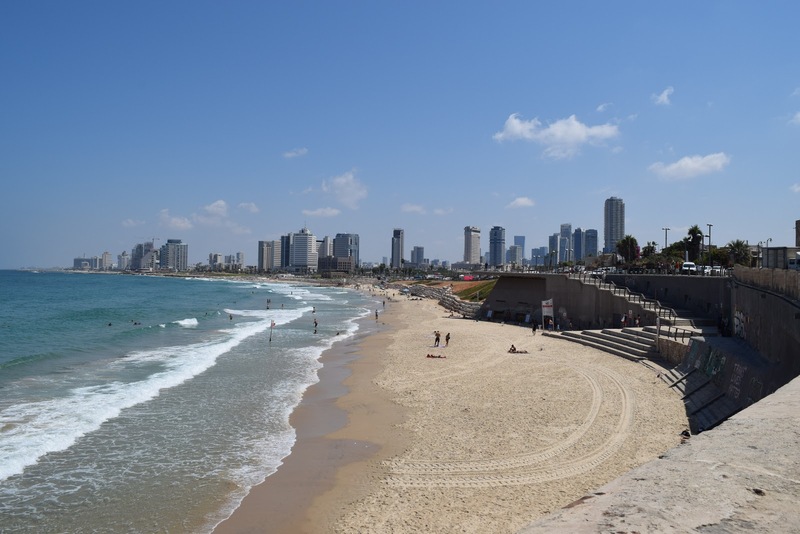 If you aren’t familiar with Tel Aviv, Yafo is also known as Old Jaffa or the old city of Tel Aviv. There is a great, free two hour walking tour that goes through all of Yafo and it’s diverse history. The tour itself is free but the guides to accept (and expect) tips at the end of the tour. The tour opened my eyes to how much history I wasn’t even aware of. Like the old clocksmith who petitioned the town to build a clock tower when the train station was built so his work wouldn’t be constantly interrupted by passerby’s who needed to know the time. Little did he know, most of the town was unable to read the clock when the tower was installed and he was continued to be asked the time. Today was a true vacation day. 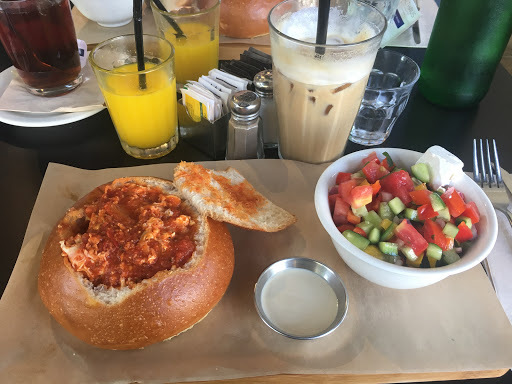 My friend had to work, so I treated myself to a true Israeli breakfast at Landwer Cafe. I started with a green apple juice and a mint tea. I was shocked at the difference a freshly squeezed juice made. The flavor was crisp and bright and tart without being “pucker your lips tart”. The mint tea was simple, just mint leaves with hot water but it needed nothing else. I ordered the Lanwer’s Breakfast with a plain omelette. I wasn’t fully expecting the feast that followed! 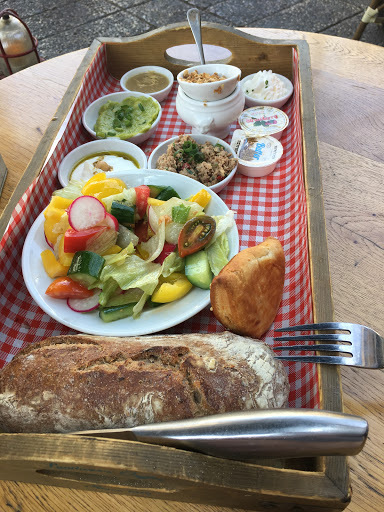 It came with morning salad (cucumber, tomato, onion, bell pepper), tuna salad, cream cheese, feta, guacamole, labnah (a yogurt cream cheese), halva spread (sweet tahini), yogurt, granola, jam, butter and bread. With all of this food, it turned into a very leisurely morning as I watched people walk by. My leisurely morning turned into a leisurely afternoon of walking the pup and diving into A Man Called Ove (which I highly recommend!). 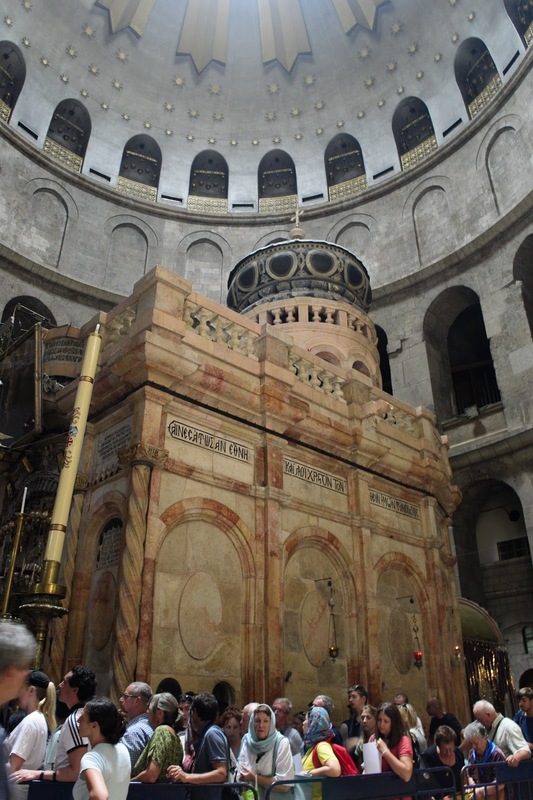 I need to start day seven with a disclaimer: I was not prepared to visit Jerusalem. I am not a religious person and my knowledge of religious history is shamefully small. I also only saw a small portion of Jerusalem, we opted to skip out on many of the attractions from my lack of knowledge and the fact that it was 100 degrees (I kid you not). We took the hour bus ride from Tel Aviv to Jerusalem. It was a pleasantly short trip. The bus arrived outside of the city, so we were met with great views of new Jerusalem. One of the first things I noticed was the diversity in architecture here as compared to Tel Aviv. Our first stop was Marzipan. A must for freshly baked pastries and cinnamon rolls. We were grateful for the sugar to keep us going through today. Then we headed to the Old City. When you first enter the Old City you’ll enter one of the quarters and head down a covered cobblestone street. Wander through the street vendors and see what’s for sale. If something catches your eye, feel free to ask how much it is, but save your shopping for on the way out. Follow the crowds (or the signs) to the Western Wall. Ensure that you’ve got something to cover your shoulders if they aren’t by what you’re wearing. There’s a quick security check before you enter the plaza. I had to take a minute in awe when we entered the plaza. I was stunned by how many people had come to be in the presence of the wall. There weren’t any usual signs of tourists in Jerusalem – no buses, no conspicuous tour groups and definitely no fanny packs so the sight of so many people was almost mesmerizing. After the wall we headed to the Church of the Holy Sepulchre. If you’ve ever been to some of the most famous churches in Europe, you have a bit of an expectation for famous churches. Those expectations will not hold true in Jerusalem. Jerusalem has a different aura all together, one that is more reserved and seems almost sacred. There’s only a few guards and no ropes leading you in the right direction. You’re given the freedom to wander and take in the sights around you. After visiting the landmarks, take a stroll through the different quarters to pick up souvenirs and gifts. I picked up a pair of leather sandals, a set of hand painted Armenian-pottery bowls and a spoon rest. Haggling is welcome here and don’t be afraid to compare prices. On our way back to the bus station, we stopped at the Mahane Yehuda Market and picked up some dried fruit tea and dried strawberries. With the last bit of shopping complete, we boarded the bus back to Tel Aviv so I could pack and head on to my next adventure!